You’re tasked with creating a login form. Email, password, submit button, done. “This will be easy,” you think to yourself. You’ve made similar forms many times in the past; it’s essentially muscle memory at this point. You’re working closely with a designer, who gives you a beautiful, detailed mockup of a login form. Sure, you’ll have to translate the pixels to meaningful, responsive CSS values, but that’s the least of your problems. As you’re writing up the HTML structure and CSS layout and styles for this form, you realize that you don’t know what the successful “logged in” page looks like. You remind the designer, who readily gives it to you. 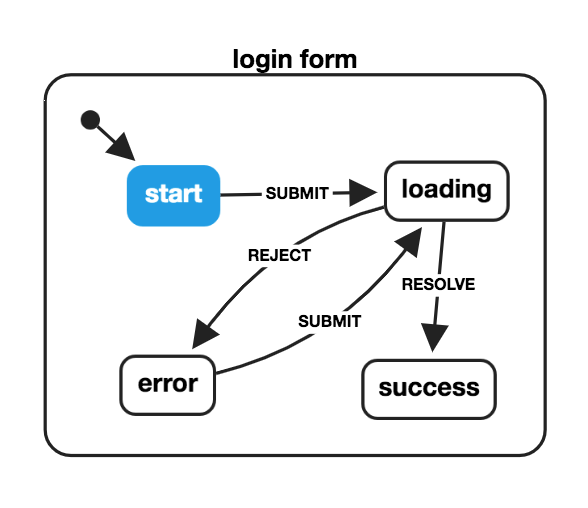 But then you start thinking more and more about how the login form is supposed to work. What if login fails? Where do those errors show up? Should we show errors differently if the user forgot to enter their email, or password, or both? Or should the submit button be disabled? Should we validate the email field? When should the errors disappear? What do we show during the login process? Some loading spinner? What if loading takes too long, or a server error occurs? Many more questions come up, and you (and your designer) are understandably frustrated. The lack of upfront specification opens the door to scope creep, which readily finds itself at home in all the unexplored edge cases. Describing all the possible user flows and business logic of an application can become tricky. Ironically, user stories might not tell the whole story – they often leave out potential edge-cases or small yet important bits of information. However, one important (and very old) mathematical model of computation can be used for describing the behavior and all possible states of a user interface: the finite state machine. From the start state, when the SUBMIT event occurs, the app should be in the loading state. From the loading state, when the RESOLVE event occurs, login succeeded and the app should be in the success state. If login fails from the loading state (i.e., when the REJECT event occurs), the app should be in the error state. From the error state, the user should be able to retry login: when the SUBMIT event occurs here, the app should go to the loading state. Otherwise, if any other event occurs, don’t do anything and stay in the same state. Every state is represented by a box, and every event is connected to a transition arrow that connects two states. This makes it intuitive to follow the flow and understand what the next state should be given the current state and an event. Drawing a state machine doesn’t require any special software; in fact, using paper and pencil (in case anything changes!) does the job quite nicely. However, one common problem is handoff: it doesn’t matter how detailed a user story or how well-designed a visualization is, it eventually has to be coded in order for it to become part of a real application. collaborate better by understanding the entire application model equally. I’m not the first to suggest that state machines can help bridge the gap between design and development. 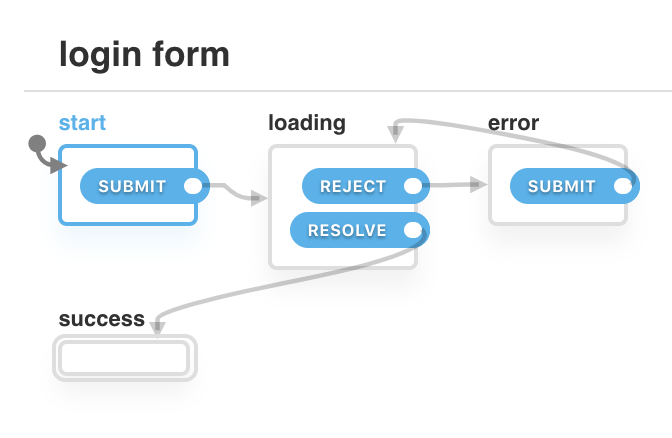 User flow diagrams, which visually describe the paths that a user can take through an app to achieve certain goals, are essentially state machines. Numerous tools, from Sketch plugins to standalone apps, exist for creating them. In 1999, Ian Horrocks wrote a book titled “Constructing the User Interface with Statecharts”, which takes state machines to the next level and describes the inherent difficulties (and solutions) with creating complex UIs. The ideas in the book are still relevant today. More than a decade earlier, David Harel published “Statecharts: A Visual Formalism for Complex Systems”, in which the statechart - an extended hierarchical state machine model - is born. I gave a talk at React Rally over a year ago about how state machines (finite automata) can improve the way we develop applications. The latest one is from Reactive Conf, where I demonstrate how statecharts can be used to automatically generate test cases. I’m excited about the future of developing web and mobile applications with statecharts, especially with regard to faster design/development cycles, auto-generated testing, better error prevention, comprehensive analytics, and even the use of model-based reinforcement learning and artificial intelligence to greatly improve the user experience. 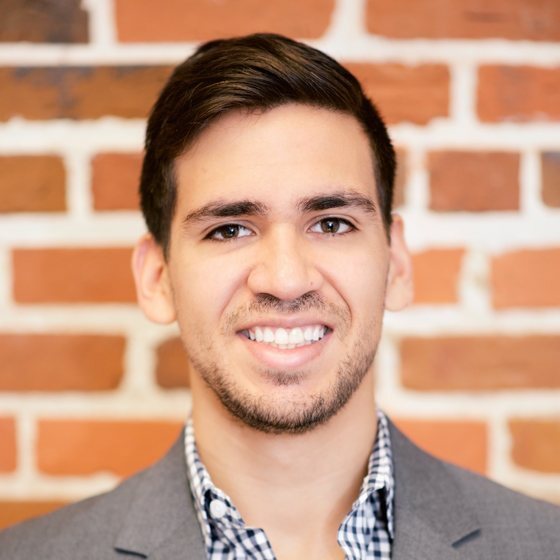 David Khourshid is a Florida-based web developer for Microsoft, a tech author, and speaker. Also a fervent open-source contributor, he is passionate about statecharts and software modeling, reactive animations, innovative user interfaces, and cutting-edge front-end technologies. When not behind a computer keyboard, he’s behind a piano keyboard or traveling.